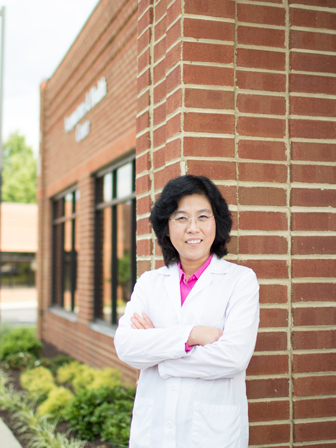 Nationally Certified and Commonwealth of Virginia Licensed Acupuncturist; Professionally trained in Eastern and Western Medicine, she has practiced Traditional Chinese Medicine since 1985 and as an Internal Medicine Doctor (conventional Western Medicine) in China for 13 years. Ruiping Chi, L.Ac., is an acupuncturist nationally certified by NCCAOM and licensed by the Commonwealth of Virginia. She began her career in medicine as an Internal Medicine doctor (conventional Western Medicine) in 1985 at Youai Hospital in Shijiazhuang, China and expanded her practice to include acupuncture and Traditional Chinese Medicine. She currently sees patients at the Acupuncture & Health Center in Richmond, VA.
Due to her unique in-depth knowledge, training, and professional experience in both Eastern and Western medicine, Ms. Chi is able to combine underlying precepts from both systems of knowledge to customize treatment plans for each patient according to his/her needs. She has successfully treated a wide range of conditions including but not limited to, pain management, allergies, immune system disorders, neurological and musculoskeletal disorders, gastrointestinal disorders, cardiovascular disorders, gynecological conditions, etc. Throughout her professional career, Ms. Chi has come to recognize the power of Eastern medicine techniques in restoring the body’s innate healing power to combat chronic conditions that are normally treated in Western medicine with drug therapy and/or surgery that can be invasive or have many side effects. She is passionate about providing exceptional care that is tailored to each patient to improve the overall quality of life. Ruiping Chi was trained in Western and Eastern Medicine at Hebei Medical University in China. After graduating, she specialized in Internal Medicine as a conventional doctor and expanded her practice to combine Eastern Medicine therapies. Wimolnut Auttachoat, JianFeng Zheng, Rui P. Chi, Andrew Meng and Tai L. Guo. Differential surface expression of CD18 and CD44 by neutrophils in bone marrow and spleen contributed to the neutrophilia in thalidomide-treated female B6C3F1 mice. Toxicology and Applied Pharmacology 2007; 218(3): 227-237. Tai L. Guo, Chi, R.P., Hernendez, D.M., Auttachoat W, and Zheng JianFeng: Decreased 7,12-dimethylbenz[a]anthracene-induced arcinogenesis coincides with the induction of anti-tumor immunities in adult female B6C3F1 mice pretreated with genistein. Carcinogenesis 2007 Dec; 28(12): 2560-6. TL Guo, Chi RP, Karrow NA, Zhang LX, Pruett SB, Germolec DR, and White KL Jr. Thalidomide enhances both primary and secondary host resistances to Listeria monocytogenes infection by a neutrophil-related mechanism in female B6C3F1 mice. Toxicology and Applied Pharmacology 2005 Dec 15; 209(3): 244-54. Tai L. Guo, W. Auttachoat, and Rui P. Chi. Genistein enhancement of respiratory allergen trimellitic anhydride-induced IgE production by adult B6C3F1 mice following in utero and postnatal exposure. Toxicology Science 2005 Jul 27; 87(2): 399-408. T.L. Guo, R.P. Chi, X.L. Zhang, D.L. Musgrove, C. Weis, D.R. Germolec and K.L. White, Jr. Modulation of immune response following dietary genistein exposure in F0 and F1 generations of C57BL/6 mice: Evidence of thymic regulation. Food and Chemical Toxicology 2006 Mar; 44(3): 316-325. Tai L. Guo, Rui Ping Chi, Dori R. Germolec, and Kimber L. White, Jr. Genistein stimulation of immune response B6C3F1 mice is affected by exposure duration, gender, and litter order. Journal of Nutrition 2005 Dec 15; 135(10): 2449-2456. While attending medical school at Hebei Medical University, Ruiping Chi simultaneously learned Eastern medicine techniques as part of her curriculum. After she graduated in 1985, she practiced conventional Western medicine for 13 years in the division of Internal Medicine at Youai Hospital in China. After having seen the various therapies used to treat chronic conditions in Internal Medicine, Ms. Chi wanted to find better ways to care for patients. She expanded her practice to combine Western Medicine and Traditional Chinese Medicine/acupuncture to manage these conditions without applying typical surgical or drug therapies that may be invasive and/or have various known and unknown side effects. After moving to the U.S., she began her Traditional Chinese Medicine practice in Virginia, specializing in acupuncture and Chinese herbal therapies. Her treatment philosophy revolves around customizing treatment plans that cater to the patient’s needs, focusing on the beneficial juxtaposition of Eastern and Western medical concepts. In her spare time, Ruiping Chi enjoys catching up on the newest medical academia in various areas of medicine. She also loves to take walks and play with her adorable maltese/poodle mix, Yoyo.